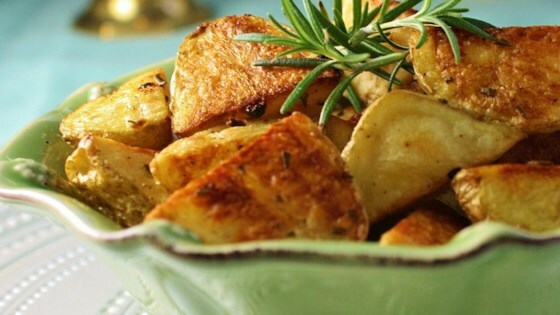 "With these potatoes, you wont miss the loads of oil in regular fried potatoes. Golden on the outside, tender on the inside." Rinse and dry potatoes with a paper towel and transfer to a large bowl. Add olive oil, seasoned salt, salt, and black pepper; mix well. Spread potatoes on a baking sheet. Bake in preheated oven for 30 minutes, turning potatoes occasionally. Continue baking until potatoes are tender and golden brown, about 30 minutes more. big hit with the family . they were so easy to make and so tasty. I added minced garlic and onion, and used sea salt in place of the regular salt. I cut salt in half to make healthier option. Probably could have cut pepper back too, but they were great and simple just the same!